Customize websites for mobile devices (release candidate). Is there a better alternative to Adobe Shadow? Is Adobe Shadow really the best app in HTML category? Will Adobe Shadow work good on macOS 10.13.4? Adobe Shadow is a new inspection and preview tool that allows front-end web developers and designers to work faster and more efficiently by streamlining the preview process, making it easier to customize websites for mobile devices. Synchronized Browsing and Refreshing (Device Pairing) -- Wirelessly pair multiple iOS and Android devices to your computer . With Shadow, you browse in Chrome, and all connected devices will stay in sync. Version 1.0.242: Release notes were unavailable when this listing was updated. 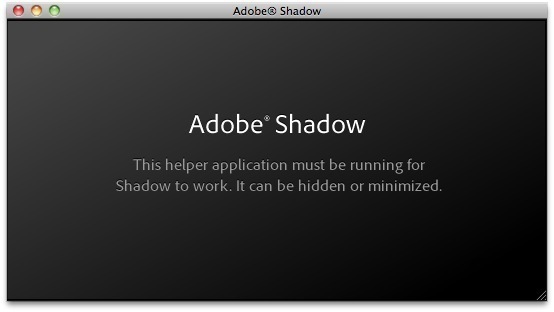 Adobe Shadow needs a review. Be the first to review this app and get the discussion started! Adobe Shadow needs a rating. Be the first to rate this app and get the discussion started! Screenshots -- Press a single button to grab screenshots from all your connected devices and easily save & send them to colleagues. Localhost URL support -- Shadow now works correctly with URLs containing localhost, and 127.0.0.1. On Mac OS X, it also works with machine.local. Adobe Edge integration -- If you are using Adobe Edge, the Preview in Browser command now works with Shadow. You will see your animations previewing in Chrome, and on all of your Shadow devices. Note: This requires Chrome to be the default browser. Cache Management -- Use the Pull to Refresh gesture on Shadow devices to clear the cache on one device, and the Refresh All button in the Chrome Extension to clear the cache for all connected Shadow devices. URL Monitoring -- Pages/apps that change URL parameters or navigate to new states using '#' anchors now work correctly. Shadow monitors the Address Bar in Chrome, and sends updates to Shadow devices as they happen. SSL Support -- Use unsigned SSL certificates during development. Connected Shadow devices will provide a dialog prompting you to accept an unsigned certificate. Amazon Kindle Fire support -- Shadow is available in the Amazon Appstore for Android, and will be installed easily on Kindle Fire devices. Shadow will be updated regularly to stay in sync with web standards, web browser updates and support for new mobile devices entering the market, while incorporating user feedback to provide the best functionality and experience possible.